Many credit unions across the industry have expressed the need to grow deposits. But in suburban Atlanta, Georgia United Credit Union ($1.4B, Duluth, GA) has created an executive position with that mandate. 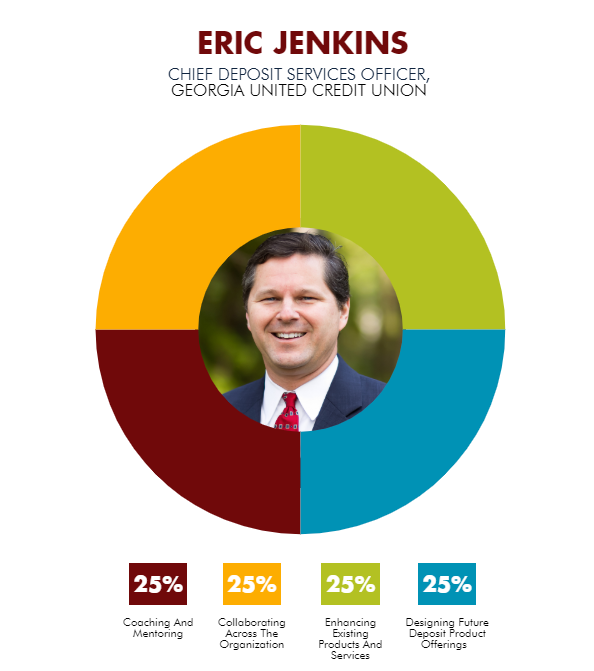 Eric Jenkins is now Georgia United’s chief deposit services officer, a title that more tightly focuses a goal he had when he joined the credit union in January 2014 as its senior vice president of operations. In the past five years, the 163,412-member cooperative has increased deposits at a steady clip. But, like most credit unions its size, Georgia United’s loan-to-share ratio has risen in response to strong loan demand. 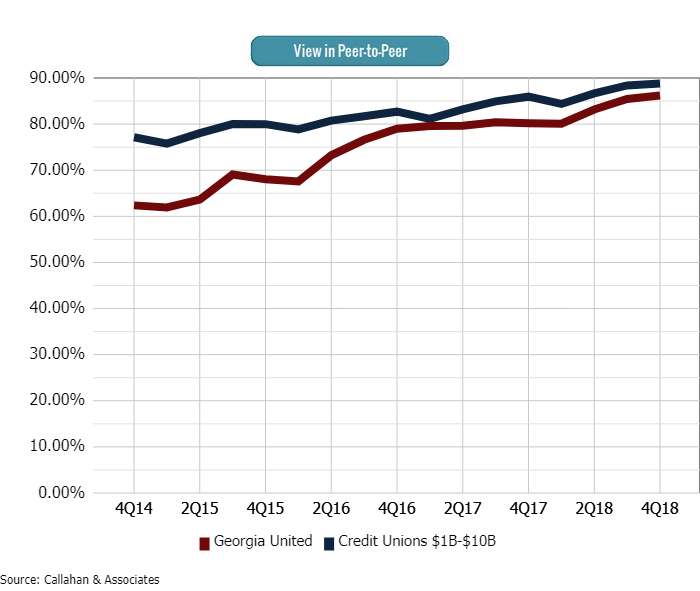 Georgia United’s loan-to-share ratio has grown steadily to close to its peer group average in the past five years, reaching 86.19% at year-end 2018, just below the 88.82% for the 302 credit unions in the $1 billion to $10 billion asset class. Jenkins is now putting his decades of experience driving credit union growth to work refining a lineup of deposit accounts that include its Unified Checking account, Prime Share savings account, a you-name-it account in which members can designate what they’re saving for, club accounts, and IRA savings accounts and certificates. Here, Jenkins explains what’s behind his unusual title as he leads efforts to enhance member value by growing more deposits and funding more loans. Why did Georgia United create this role? What challenges and opportunities do you address? EJ: We wanted to provide deposit accounts the same type of representation on the executive team that lending products have. The assumption has always been that you just have to tweak rates to get more deposits, but you have to more actively work to sell loans. We’ve learned you have to actively work to sell both products in today’s market to encourage consumers to bring you their deposits as well as their loans. It’s not that deposits weren’t considered important;there’s just been an assumption that they’re easy to gather. They’re not anymore. Especially with the rise of online deposit account offerings, I’ve never experienced the competition for deposits we see in today’s marketplace.We have to make the case for our deposits as compelling as the case for our loans. Who do you report to and who reports to you? EJ: I report to our executive vice president for service and sales. My direct reports are our director of deposit services [deposit ops, quality assurance, branch ops, help desk], our director of e-payments [debit and credit cards, ACH, wires, P2P, bill pay, online and mobile payments], and our director of facilities and security. EJ: I’ve had a 30-year credit union career designing and launching new deposit products. I came to Georgia United in 2014 after seven years at the Georgia Credit Union Affiliates, where I was senior vice president of growth services and spent a significant amount of time with our member credit unions supporting product and business development; reviewing loan, deposit, and other offerings; and conducting gap analysis. Before that, I was the CEO of a SEG-based credit union in South Carolina for 10 years. EJ: It varies but usually includes check-ins with team members in Deposit Services and peers in other departments, emails and calls with vendor partners, and reviews of multiple reports and data analytics. I also try to find time each day to think about how our deposit product offerings should evolve in the future. EJ: Deposit accounts, including their enhancement and growth, as well as deposit operations, payments activities, and facility security and safety. What does success look like at your job? EJ: Developing new deposit account offerings and regularly enhancing the current product line. And, exceeding our deposit growth goals on an annual basis. EJ: I regularly read financial institution trade periodicals, HBR publications, and the Wall Street Journal online. I also try to attend one or two conferences every year that are not exclusively geared to credit unions, such as the Visa Payments Forum. Do you know of any other credit union executive with your title or role? With whom do you network? EJ: I’m not aware of any others in the credit union industry with the title, but I have seen similar positions at banks. The majority of my networking is with peers in the operations and payments areas. Job titles say as much about the organization as they do the person. Have you seen a title you’d like to know more about? Let editor Rebecca Wessler know at rwessler@creditunions.com or (202) 223-3920, ext. 503.This interview has been edited and condensed. How do your loans and deposits compare to other credit unions. Using Callahan Analytics, it only takes a few minutes to see how you compare against your peers. Stay ahead of the trends.